Original Poster. ‘Together for the first time’ . . . and the last. 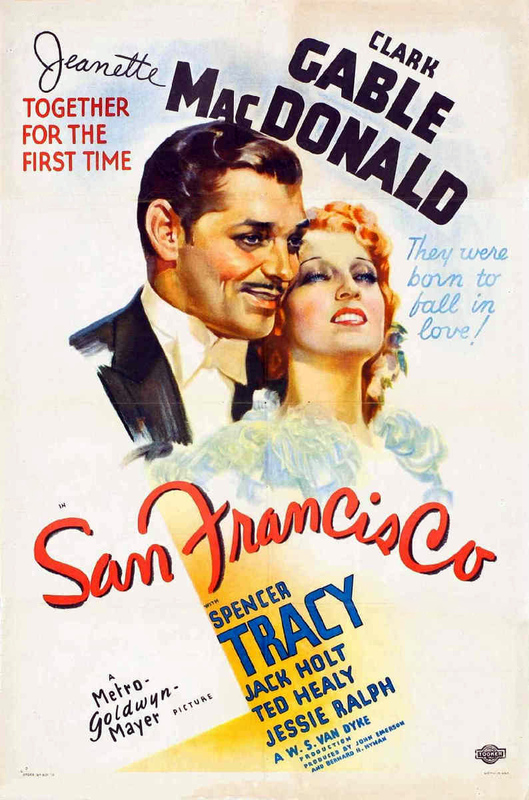 When “San Francisco” (MGM, 1936) was first announced, the combination of Clark Gable (as Barbary Coast saloon-keeper Blackie Norton) and Jeanette MacDonald (as fluttery songbird Mary Blake) must have seemed an unlikely one, but they make a surprisingly effective pair. They have real chemistry: he seems genuinely to attract and terrify her (as the story calls for), while her nervous bravado genuinely seems to amuse him. MacDonald frequently played women on the run from the baritone or tenor into whose caress she would inevitably fall, but this may be the only time that the Iron Butterfly (as she was often called) seemed to be in any real danger of losing control of the situation. She was never funnier. Here she is near the beginning of the picture, when she comes looking for a job from Clark Gable. 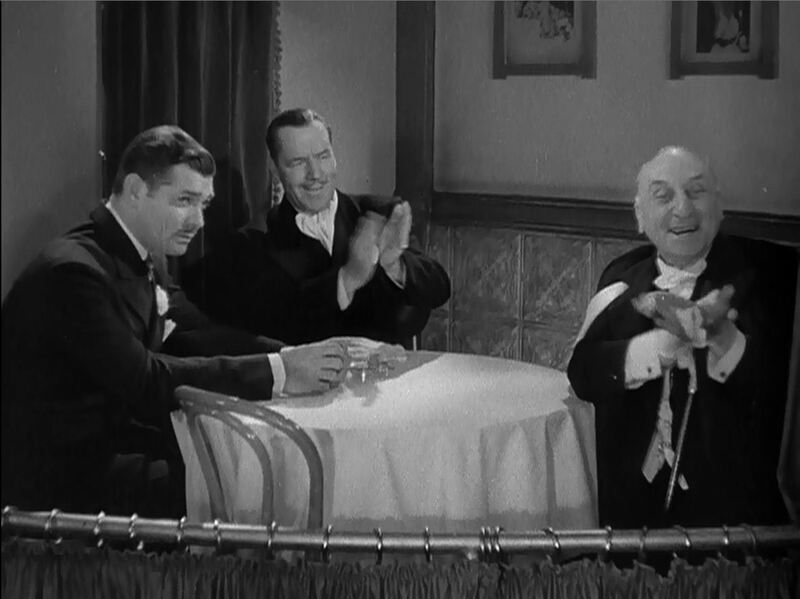 The guy who cracks wise at the end of the scene is Ted Healy, a popular comedian of the era. Among other things, Healy was well-known for his a long association with the Three Stooges (he and Moe Howard were childhood friends). In the 1920s, he was the highest paid entertainer in vaudeville. He died in 1937 under mysterious circumstances. His death certificate issued by the State of California lists the cause of death as toxic nephritis, but newspapers at the time reported that he died of complications from a serious head injury sustained in a nightclub donnybrook while celebrating the birth of his first child; other reports claimed he died of a heart attack at home. Take your pick. I like the head injury story — it comports well with the Three Stooges connection. As Mat, the manager of the Paradise, Healy plays a small but important one-joke role. He thinks Blackie’s crazy for hiring this dame — her kind of singing will drive the customers away. Blackie has big plans for his new discovery, but some changes will have to be made. The first time he hears her twittering the title song, he stops her. Blackie: Put something into it! Heat it up! That’s what it’s about! San Francisco! Mary: But I can’t sing like that, Mr Norton . . .
Blackie: That’s the way you’re going to sing it, or you’re not gonna sing it for Blackie! That’s Blackie the pragmatic saloon-keeper talking; in his heart, he knows that she’s slumming, that she’s too good for his trap. Mat does not: he has little use for her airs and graces, and none at all for her lugubrious ululations. So he serves as an insurance policy for low-brows (and for opera connoisseurs, too). Every time she opens her mouth, Mat is on hand to pull a sour face and make it all right for us to dislike her kind of singing, too. 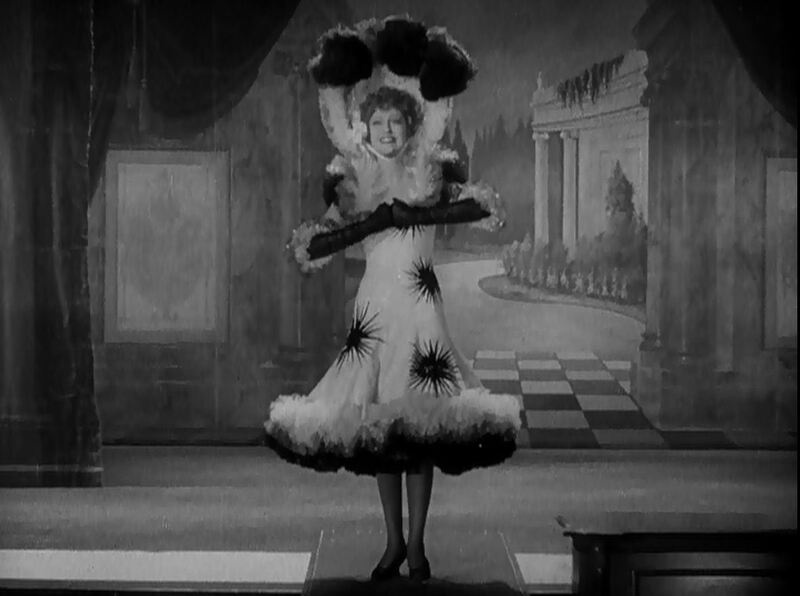 The first time we see Mary perform publicly at the Paradise, she’s dressed in one of Adrian’s silliest costumes, though there are a few others in the picture to rival it. She looks like a cross between Big Bird and the Merry Widow, but her prim stuffiness also reminds me of a star-bellied Sneetch. Jeanette MacDonald, the Toast of the Barbary Coast: Swing out, sister! She’s a good sport, I’ll give her that. Upon hearing Mary Blake rehearse a number at the Paradise, a visiting opera impresario, il maestro Baldini (William Ricciardi), expresses his admiration by quoting a proverb from Plautus’ comedy, “The Captives”: “Ut sæpe summa ingenia in occulto latent!” After a slight pause, Blackie says, “Ya took the words right outta my mouth.” Roughly translated, the Plautine maxim is, “How often the greatest talent lies hidden in obscurity!” or more roughly translated, “What’s a nice girl like that doing in a dump like this?” No translation is offered in the picture. I assume this is because Latin was still taught in public schools when the picture came out, and the quotation was nearly as familiar to Latin students as Caesar’s “Gallia est omnis divisa in partes tres.” The quotation has something in common with Shakespeare’s famous maxim, “To thine own self be true”: in both cases, the character in the play who speaks it is a comic scoundrel. In “The Captives,” the speaker of the apothegm is listed in the dramatis personæ as “Ergasilus, the parasite” — he’s an ancient blend of George Costanza and Cosmo Kramer; he says the line as a means of flattering the rich old fool from whom he’s trying to cadge a free dinner. This strikes me as a nice metaphor for “San Francisco” as an entertainment: at heart, it’s a roguish stew of romantic comedy, melodrama and cheerfully corny music, but it is tricked out with Latin quotations and operatic sequences to give it class and flatter our intelligence. Ironically, the highfalutin stuff makes the picture more vulgar, not less. At any rate, it’s a lot of fun. The picture also contains more than a few speeches by God-fearing Catholic Cassandras, who assure us that San Francisco’s godlessness is bound to lead to the Armageddon of the final reel. The first time I saw the picture, the amount of religious chatter about wickedness and divine retribution startled me. In places, it’s practically a love letter to the Church of Rome. Not only Father Mullin (Spencer Tracy) gets to spout, but comical old Mrs Burley (Jessie Ralph) has a long, maundering speech about End of Days, and MacDonald sings not one, but three hymns: “Jerusalem,” “Nearer My God to Thee” and, at the very end “The Battle Hymn of the Republic” . . . all this in a picture written by that arch-flapper, Anita Loos! Lorelei Lee takes the veil. Is it possible she was serious? At length, I decided it was just Metro’s way of putting on airs, because they thought it gave the picture gravitas. It doesn’t. It doesn’t do any harm, either: it merely makes it a little bit sillier. It amuses me that il signor Baldini actually misquotes Plautus quite badly (the quotation above is correct: why rehearse error?) . . . I’d like to think this was intentional, but I doubt it. Gable, Tim Holt, William Ricciardi: The Plautus thickens . . .
Here’s a scene with Gable playing Big Bad Wolf to MacDonald’s Little Red Riding Hood, and with some Godly rigmarole thrown in. It offers a fair idea of what the whole picture is like — saints and sinners side by side. MacDonald’s timorousness in the last seconds of this clip is, I think, the wittiest bit of acting she ever did. Elsewhere in the picture, she’s up to her usual, artificial tricks — indignant little sniffs, silent era pantomime gestures and so forth. Her acting in this scene isn’t exactly realistic, either, but it’s specific, beautifully timed and very funny. The way her eyes dart about before she she speaks Blackie’s name, and the fraidy-cat whisper she employs when she says, “Blehckie . . .” give the impression that she believes she has just taken her first uncertain step down the primrose path to Perdition. I think it’s hilarious. Billie Burke couldn’t have played this moment better. Blackie’s atheism is just scornful enough to let you know that he’ll have to convert in the final reel, after the vengeful God has set his rafters a-rattling and crushed thousands of sinners, women, children and dress extras under piles of balsa wood debris. As a matter of fact, the earthquake sequence is thrilling. The special effects are astonishingly realistic; the juxtaposition of ceilings caving in, walls crumbling, buildings collapsing, pavement opening up, followed by moments of quiet and then even more calamitous aftershocks — sudden explosions, fireballs, nearly-rescued victims being buried under new torrents of falling bricks — it’s all very life-like and terrifying. And unlike nearly every disaster flick that followed “San Francisco,” the story does not seem like it’s simply marking time before the disaster strikes. Here’s the Judy Garland version of the title song, with the witty verse written specially for her by Roger Edens. This entry was posted in Main and tagged Blackie Norton, Clark Gable, Jeanette MacDonald, Jessie Ralph, Judy Garland, Mary Blake, Roger Edens, San Francisco, Spencer Tracy, Ted Healy, Woody Van Dyke on May 8, 2013 by TR.